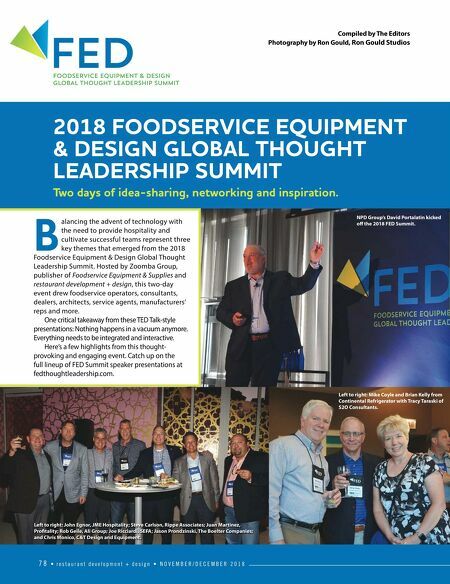 7 8 • r e s t a u r a n t d e v e l o p m e n t + d e s i g n • N O V E M B E R / D E C E M B E R 2 0 1 8 2018 FOODSERVICE EQUIPMENT & DESIGN GLOBL THOUGHT LEDERSHIP SUMMIT To days of idea-sharing, netorking and inspiration. 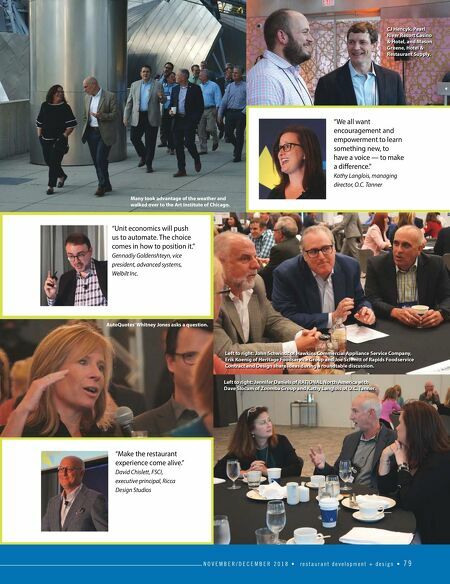 FED Compiled by The Editors Photography by Ron Gould, Ron Gould Studios B alancing the advent of technology with the need to provide hospitality and cultivate successful teams represent three key themes that emerged from the 2018 Foodservice Equipment & Design Global Thought Leadership Summit. Hosted by Zoomba Group, publisher of Foodservice Equipment & Supplies and restaurant development + design, this two-day event drew foodservice operators, consultants, dealers, architects, service agents, manufacturers' reps and more. One critical takeaway from these TED Talk-style presentations: Nothing happens in a vacuum anymore. Everything needs to be integrated and interactive. Here's a few highlights from this thought- provoking and engaging event. Catch up on the full lineup of FED Summit speaker presentations at fedthoughtleadership.com. Left to right: John Egnor, JME Hospitality; Steve Carlson, Rippe Associates; Juan Martinez, Pro tality; Rob Geile, Ali Group; Joe Ricciardi, SEFA; Jason Prondzinski, The Boelter Companies; and Chris Monico, C&T Design and Equipment. Left to right: Mike Coyle and Brian Kelly from Continental Refrigerator with Tracy Taraski of S2O Consultants. NPD Group's David Portalatin kicked oŽ the 2018 FED Summit.